Meza is a fresh and responsive WordPress restaurant theme from OrganizedThemes developer club. This theme is specially designed to use for any kind of online restaurant websites to create online food orderings systems or showcase their service for the customers. 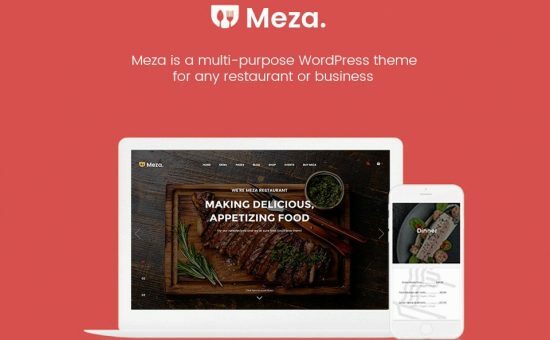 Meza WordPress Theme is a simple and powerful lightweight responsive WordPress theme that is ready to go and create a restaurant website in one click of demo content which will allow you to alter the content and make your website within 30 minutes. Meza theme has built with drag and drop page builder plugin that allows you to build your own customized pages according to your needs. This theme has been built with “WPBakery Page Builder plugin” which is a customized solution for page layouts. It is a 3rd party plugin that integrated with Meza WordPress Theme. But make sure you keep up to date of the plugin installation to work with the theme. There are plenty of custom widgets available with page builder plugin to create a unique and elegant website design for your online restaurant websites. Meza WordPress Theme has built with 6 different restaurant food menus to use directly from the theme options. Each menu will give a different approach and experience for the customers. The food menu options include classic food menu, grid food menu, grid food images, grid parallax, tabs, and box lists. Additionally, your food menu items can be categorized to showcase them all organized to display for the visitors. It can be used for cafes, coffee shops, wineries, steakhouses, food shops, bars and etc. Custom controls for header and footer styles, header color, logos, primary site color and etc.